Had a few paddles recently in a pals Explorer. It's an older version, no beer cooler . It has built in bouyancy along the floor, a double skin with raised cells running across the boat, similar to those still in use on the Bayou model but sealed all round at the gunnals. They make life awkward for solo use. A kneeling thwart wouldn't leave room for your feet and you can't get your legs under the centre seat but parking your bum on a small rucksack or the likes the raised floor puts you at a very usable height and the cells have a bit of give and are pleasant to kneel on. Tandem wise, the first thing you notice are the molded knee placements. Again the double skin has a bit of give and frankly this is the comfiest I've been in any canoe. A couple of hours isn't really a long time but I got the feeling that all day sessions will be pretty painless. The next thing I noticed was how quick the boat is. I've only paddled Prospector designs and an OT Camper tandem and the ease of paddling came as a bit of a surprise. It cuts through the water and glides far better, no doubt due to it's odd shaped bow/keel arrangement. In all I was left thinking that for less than 200 quid in good nick it was a great wee buy and a worthwile addition to the fleet. It'll be the first choice for tandem trips for sure. ...and although the cup holders on the centre seat are a waste of space the rod holders work a treat. I'll update the review after it's been rattled down a river or two where I suspect it'll be a hazard to shipping. Should be tricky to sink though . If you look on e-bay, they've made it. Someone as even been to costco and taken a photo of one. They're charging between £370-470. I've just bought a brand new one from a guy off ebay for £370 with two paddles and am happy at what I have just read about the boat - cant wait now to get on the water. Hi, I have a Pelican from Costco, as already mentioned, great price. Does anyone know where I could get a centre seat from to replace the cooler unit, I`m more interested in getting camping kit in boat than keeping beer cold. If I need to I will make a yoke to fit the boat ( similar to some other pelican models), but the moulded centre seats on the remaining pelican boats would be even better - I must have mentioned the whole Pelican range in this post !! The centre seat holds the keelson in place and stops the boat from distorting, taking it out can cause problems. The old Coleman RamX 15 had an alloy frame in the centre, if you can get hold of one of those or make something similar that would be the answer. The only Pelican boat's that had a yoke was the RamXcell series but they did not have a keelson. I have made a lightweight Yoke out of Carbonfibre and foam and have a central "leg" on it to maintain pressure on the keelson. Its only for when we have campbeds, tents etc so they are not around our feet when paddling. ... Does anyone know where I could get a centre seat from to replace the cooler unit, I`m more interested in getting camping kit in boat than keeping beer cold. You could try a PM to Lakeland Pete. His Coleman's centre seat broke and he asked for a replacement. Think he got one but can't remember. But if he did, he never fitted it again, opting for a thwart instead. Have read a review elsewhere (think it was an american site) saying that they capsised and the boat sank like a stone. Can anyone else comment on this, is the boyancy built into the seats not enough, or does it need added boyancy? Seriously thinking this may be my first boat, purley cos of the price! Have tried sinking the Coleman and it floated, we also tried the same thing with a newer Pelican Explorer from Costco (I guess my mate had read the same review ) and it floated, but only just. There seem to have been some bad decisions made when the name changed to Pelican, (at one point they apparently left out the keel tube) The one's in Costco currently look much the same as the old Coleman in terms of seat volume, keel bar etc. so I presume they will also float swamped, by that I mean it will not sink like a stone but you are unlikely to be able to get in and bail out, you would either have to tow it to shallow water, do a rescue with another canoe, try to paddle it swamped, or.......a capistrano flip, which with the Pelican I suspect may not be possible . They are, however very stable and unlikely to tip you out unless you try quite hard. If it was a major concern you could fit some bouyancybehind the aft seat and forward this would reduce the amount of water in the boat and it would float a bit higher. If you go for the Apache you will need to fit some bouyancy anyway. Coleman Canoes have been made by Pelican for some years now, the only difference was the badging and some slight cosmetic changes. Most canoes without extra buoyancy will float level with the gunwales this is the norm, by adding extra buoyancy it displaces the water and makes emptying easier you still will need to empty some of the water out and bail out the boat before getting back on board. On this particular model the buoyancy comes from the seats and the seat cones, originally the cones had a foam fill to them but on later models this has not been the case and the cones can fill with water, it is worth taking out the seats and unscrewing the cone (there is 4 self taping screws holding it on) if there is not any foam fill it with bubble wrap or polystyrene and this will help. Thanks for the advice, seriously considering this now!!! I appreciate that this might be an old post now, but i too have one of the DLX as mentioned from Pelican. This is my first foray into paddling and I am dead chuffed with the boat. Not the fastest of boats but i appreciate the limitations that it has. To support the post from Graeme, fitting airbags will really aid the bouyancy of the (any) boat. I have also kitted mine out with lashing points threaded all along the boat and added shock cord lacing, fore and aft, to help position and hold airbags and camping gear etc. (Measure twice, drill once! )I am replacing the plastic seats with wooden web ones that will lower the centre of gravity of the boat, the big problem that I have found with the current plastic ones is that 1) they are very high up along the boat and b) the cones don't help when positioning feet inside the boat. Any replacement seats will also have to have a leg to help hold the keelson in place. These are only minor points that I have found that will help me kit out the boat the way I want it, once complete I will post some photo's. Apart from this, like I say great boat. Are these a good starter boat? Cheap (from Costco), tough as old boots, good family size, stable - yes, I'd say a good starter boat. The disadvantage is that its heavy so you will probably want to invest in a portage trolley. Certain to be a lot of fun though. Thanks. Don't have a Costco that near me. Seen some in evil bay. Perhaps I shall hunt out Costco. To support the post by Psittacosis, they are a good starter boat, but depend on what you want to do. I was loking for a boat that I could mess about in with the family, on Lochs and calm rivers, load with camping gear and have fun and i have not been disappointed. Worth searching out a Costco,I know that there is one in Liverpool on the Dock road and one in Chester which maybe the closest to you. Those on ebay are just being sourced from Costco and sold on at a higher price. Costco is around £299.00 inc VAT.Someone even has an ebay name as costco and photo's the boats in store!, still there are other threads on this subject else where! If you live close to another member who has a costco near them, maybe they would help you out. Have a word with your local canoe shop or even some of the shops who link in with this site such as Dave at Stirling Canoes, Yorkshire Canoes or the Family Adventure Store. Anyway, I am sat in work looking at the brilliant weather outside my office, wondering how I can get out early and paddle! i have never touched drugs but ive had every painkiller known to man ....evil knievel. Took mine out on Bala today and saw four being used, I was the one trying to keep up with the mink that had just caught a fish !!! Sounds like Bala was the place to be today! Psittacosis one thing to think about if you do get one from Costco is to take a set of spanners with you and a posi drive screw driver so that you can fit the centre seat/ thwart. Otherwise it is just a large piece of flimsy moulded plastic that is difficult to strap and control atop a landy. I have a freelander and wish i had thought to take my tools with me, quite a scary ride home with it above, lucky the boys in blue wern't around that evening to 'advise' me! been out with mine this evening onto Kinghorn loch after fitting my bouyancy blocks. I will take some photo's tomorrow of mine and post them up here. I bought one from Costco in Brum. Returning to canoeing after 10 years. I sold a 17' Old Town, which I found too heavy for convenience. The Pelican is lighter and more manageable. I was worried about stability after reading some reviews, but I took mine out on the Avon for its maiden voyage this week. It was hard work plugging up against wind and flow, but the boat handled very well. I could manouvre through the wind and forward and reverse turn reasonably quickly. The stability was never an issue. I took the coolr box lid off and have replaced it with a varnished woodn insert with a Pelican Seat cushion. Its too low for paddling but ideal for fishing.All in all impressive value. I am replacing my seats with wooden web seats and lowering them slightly. I posted earlier in this thread about the seats etc. 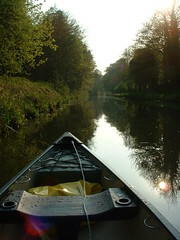 Had a good trip on the Union Canal this week and, although the boat is heavy, It is still manageable solo. To help trim the boat when Solo, i often use the cooler lid to sit on and trim forward and backwards to compensate for the wind etc. I have also kitted mine out with lashing points threaded all along the boat and replaced shock cord with para cord to hold it in tight and restrung the shock cord lacing, fore and aft, to help hold gear etc. The photo below may show a little of what I have done. I picked on of these up from Costco in Reading £305 + membership £29. This is great value and all the staff friendly and helpful taking the canoe right out to the car and offering to help put it on the car! We also picked up some good deals on food. They have 13 left as of Saturday - as said before take your tools to assemble the cooler seat - it does not travel well without. Just come back from Upper New York State. Dicks Sporting Goods sell all the craft we buy here at dollar for pound prices. The pelican explorer is £150.00, Most of the Old twn range are £3-400.00. Depressing, I couldn't get one on the plane as hand luggage. Depressing, I couldn't get one on the plane as hand luggage. Yep, yet another example of Rip-off-Britain! I wonder how many we could get in a container? The trick is to go to a shipping agent with a part container load to share the cost, typically for 1000kg about £250. This would reduce the shipping cost to a few pounds per boat. Buying say 25 units would get 25-30% discount, plus NY sales tax would not be applied, should reduce price to about £100 per unit, plus £10 shipping. Add 27% import duty and Vat = less than £150.00 each. Costco will have shipped a few hundred, so they will do very nicely. Apply the logic to a better quality craft, similar savings would apply. There are businesses that do this, called Canoe shops (or similar). They have to make a good margin because the market in the UK is really small, so I don't begrudge their profit. They have to take the risk in the first place. Is there any way I can find out if Costco at Bristol have them in stock ATM? Tis a long way from yer to Brizzle boy! And, how do you qualify for membership? I am a lowly fireman their website goes on about Trade Membership, can ordinary plebs join in? cost £20 plus VAT each. operated 8.30 am till 6pm Monday to Friday, not weekends. whether the company you work for is a registered gold card company." Last edited by GadgetUK; 6th-June-2008 at 11:36 AM. ... and ... is there a difference between the Explorer and the Colorado? It looks like the Coloado is the newer model.... is that correct? Last edited by GadgetUK; 6th-June-2008 at 11:58 AM. I have one of these explorer canoes. It is the centre seat type with the fluted double skin floors. I am looking to sell this so I can buy something for solo use. Does anyone have any idea how much I should ask for it? Its in good condition and has the two wooden paddles with it. Im hoping to be buying a new explorer within the next couple of weeks, this will be my first canoe,these weigh around 37 kg, is this awkward to put on the roof of a car myself and am i best getting someone to help, as a few have mentioned on here that the centre seat is to high i might be looking at changing the centre seat, has anyone got any pics the can send me of there canoes with modifications and emprovements etc. Yes it is definately a two person lift onto the roof although I have seen some shots of a home made 45 degree wooden slide system that forms a kind of ramp beside your car. Once off the roof though they are managable on your own and paddlable. I find if I am paddling it on my own I kneel just behind the cool box seat and to the left. This makes it lay to one side but isnt a problem on flat water and makes the j stroke easy. I have never found the mid seat too high either, although it will alwaye be better lower and have had three adults in there, two paddling and on on the mid seat drinking all my beer, it wasnt too unstable. Yes it is awkward and it is easiest if there are two of you but don't be afraid to tackle it on your own. This thread will give you some clues. Invest in a portage trolley to aid moving it from car to water etc - this was the best investment I have ever made! (a Kelly Kettle was the next best! ) Paddling solo is no problem. I sat in what would normally be the front seat, facing backwards and with a small amount of ballast (e.g. a couple of gallons of water in a container or heavy daybag etc) at the opposite end the trim will be fine. Thanks for that link Keith that looks very good, bet you get some strange looks from passers by but will certainly be safer and less chance of damaging the car or canoe. ..... will certainly be safer and less chance of damaging the car or canoe. It was the damage to me that I was concerned about! If anyone is interested, Costco are stocking these again from 3rd Feb 2009. I was quoted £390 plus VAT though Thats £100 more than previous years. Yesterday, different branches will have different delivery dates, I rang Chester and I probably got the VAT bit wrong (hopefully). Ouch, I bought one last year in Glasgow and it cost £293. Still a great value buy though. remember to take your tools, you'll have to build it in the car park to make it car portable. Did you get round to replacing the seats? They dont sell any other gear but the boat does come with paddles. I bought my Explorer last year from Costco at Haydock the main factor being price. I was in recently and noticed the large price rise. Through the summer I got great use out of the canoe with my sons and even managed to tip it over in the middle of Coniston Water. Fortunately we were travelling in tandem with another canoe and managed to do a rescue. The main thing is that the canoe did not sink although it was completely submerged. Overall the canoe is exactly what I wanted and seems sturdy enough. My only gripe is getting it onto the roof of my car as I find it is not so much the weight as the awkwardness of lifting it up without any proper grab handles that causes me a problem. I would also say that although the seats are comfortable, paddling whilst sitting on them does raise your centre of gravity and if you do this it will make any canoe unstable (fortunately the water was warm). Had an accident on my first voyage with my pelican explorer deluxe on the wye last year all safe but for my beloved canoe which till this day still sits in my rear garden as it folded under the river and needs new alluminiun gunnels and capping, Would any of you kind people know where i might get some or know where i might take it for repair as the river calls?